Does anyone here remember my old blog? You know, the one I had in high school, then replaced with this one after my my-blog-no-longer-fits-my-new-college-lifestyle freakout and a half? It was called “Of Writing and Knitting, Tunes and Balloons”? Anyone? No? Fine. Well, it existed. (Don’t go looking for it, oh by the way. I had to take it down because people were sending me a deluge of comments in foreign languages that Google Translator told me were wildly inappropriate). At any rate, the balloon part of the title was in reference to my after school gig working at a party store. I loved that job with all my heart. I think it was because I’m pretty shy in general, so I liked being forced to talk to people because my job depended on it. Or, you know, I’m five and balloons tickle my fancy. Whichever. But I had to leave it when I went to college, where I found a job that I like just as much because no customers are mean to me, I enjoy the people I work with, and no customers are mean to me (that’s important). Also, database management is apparently part of my skill set (other skills include and are limited to: turning yarn into wearable objects, walking into things, balloon making, and writing stories about old people that feature unintentional dark humor). Nonetheless, I missed my party people. Why yes. 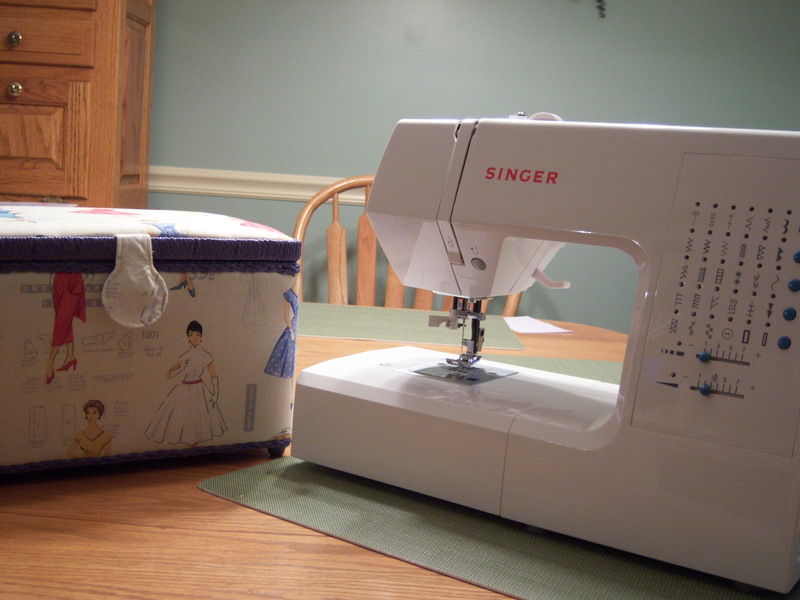 That is a sewing machine and a sewing box covered in adorable pictures of dresses from the ’50s. Sleep is for the weak.